Make efficient use of space, while brightening your environs. Trombettas on an arch made from a hog panel. Why garden high in the sky? The usual reason is to increase the space you devote to your garden: By elevating at least part of your vegetable and fruit growing, you can add substantially to your harvest. Even with all the space in the world, you can benefit by emulating Jack and his beanstalk. Fruit and flowers are off the ground, where they won't rot or become easy insect and rodent fodder. When your veggies are at eye-level rather than hidden in a tangle of vines, you're far less likely to miss their peak. Nothing is sadder than finding a sumptuous melon with its insides eaten out. But to me, the best excuse for going up is aesthetic. Trellises, arches, hanging baskets, and the like add texture, varying focal points, and hidden nooks to an otherwise flat-as-a-pancake landscape. Once you try vertical gardening in your yard (it's a must on a balcony, where space is premium), I guarantee you'll never go back to ground level. 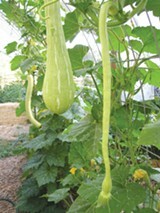 The easiest plants to grow on trellises are those that vine naturally: peas, beans, cucumbers, some squash, and melons. Brighten the environs with flowers such as sweet peas, roses, and other climbers. Consider two major factors when you choose your climbers: trellis type and sun exposure. If you satisfy both, you'll succeed at vertical gardening. In the fog belt, climbing to the heavens is a good way to infuse sun-lovers like tomatoes and squash with the warmth they need. Locate west- and south-facing walls or fences that aren't shaded by trees (if they are, consider spot pruning, remembering that at the height of summer, the sun is directly overhead). Baysiders can grow tomatoes on a south-facing wall, which serves as a heat sink for the summer sun. Although walls are best in that they store heat and reflect it back to the plant, a wooden fence adds a few degrees of warmth and bounces off some rays. Most plants will need a little help to get started on their climb. Pound in a few stakes and string some wire or twine, especially close to the ground. For many climbers such as beans and peas, this is all you need. Tomatoes require more. Stretch three to four horizontal wire lines along the wall or fence with the lowest wire about eighteen inches above the ground. You can use T-stakes as anchor and mid-posts — they have useful knobby things that hold wires easily — and they're heavy enough to bear the weight of your fruit. As your tomatoes keep on truckin', you keep on tyin', envisioning vineyard culture as a model. Don't tie too tight and be careful with tender stems. Most heirloom tomatoes are indeterminate, meaning they'll pump out vegetative growth and fruit till they give up the ghost at Halloween, as opposed to determinate varieties, which deliver an all-in-one bumper crop. Indeterminate varieties can get up to six or seven feet tall when grown on wires. Imagine how that boring fence will look come September, covered in yellow or red globes! If you're using a constructed trellis rather than a fence or wall, be sure you match your plant with a support sturdy enough to handle the weight. Growing giant squash on a flimsy four-by-eight redwood trellis spells disaster. Either the stems will break under the strain, or the trellis will say sayonara just as you're about to harvest, splitting those bounteous orange or green babes. If you have a very sturdy trellis, you can grow heavier fruits. An easy-as-pie trellis that will support squash, climbing roses, bougainvillea, table grapes, and other bulky customers is a hog panel with its narrow ends stuck in the ground to form an arch. You can buy hog panels at feed, farm, or some building supply stores (call first — they're widely available). Used for fencing, the panels are composed of heavy welded metal squares formed into a rectangle about sixteen-by-four feet. Tack one of the four-foot ends in the ground with stakes or a baseboard and bend the sixteen-foot length over until it forms an arch. You can make the walkway underneath your arch as wide as you wish, considering that the wider you make it, the lower the curve overhead, reducing your planting area (around six feet between the ends is pleasing). Once you've figured out how you want it, tack the other end into the ground, and voilà — you've just created a reasonably attractive trellis that you can use year after year. Putting several together forms a low-cost covered walkway. We have seven or eight of these arches and use them for cucumbers, beans, and other fruit — and we get double the bang by planting shade lovers such as spinach and lettuce in raised beds under the arches. You can also turn the hog panel on its side and run it down the middle of a bed as a sturdy support for tomatoes and cucumbers. 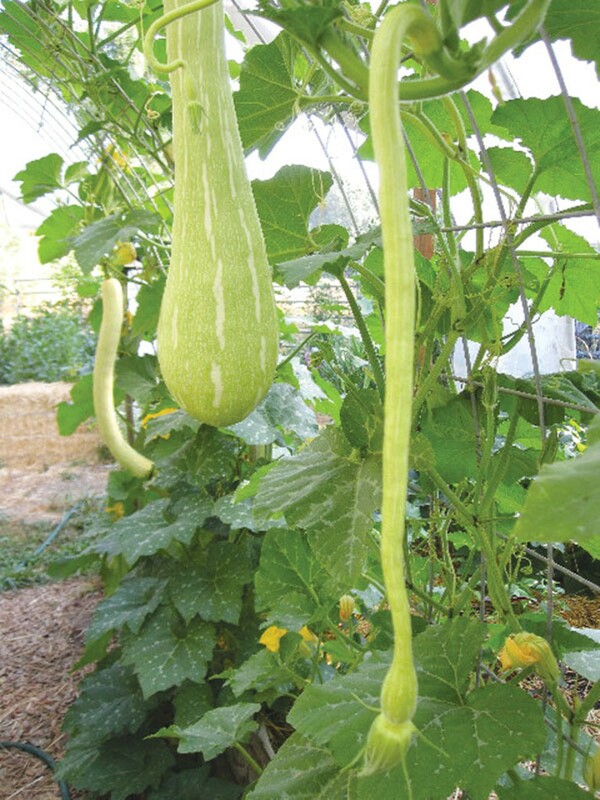 Arch customers include the Italian squash Trombetta, which looks like a green trombone that got caught in the rinse cycle; it can be used young like zucchini or baked as a winter treat. Yellow crooknecks trail easily; Gentry has a nice nutty flavor and bears well. My favorite arch denizens are Japanese cucumbers. Some varieties can go from a nubbin to eight inches in a few days, and they're perfectly crisp with vinaigrette and feta. You'll find yourself strolling out to your arch to check if one's ready for lunch. Now that you've got an arch, try a teepee. Get bamboo or tree poles, the thicker the better. Use string or wire to wrap around your teepee form, especially at the bottom, where young plants need assistance. Once your plants get climbing, look out! Beans are particularly suited to teepees, as they put out side vines and will cover the entire structure. Your biggest problem will be keeping them picked, unless you've planted shell beans, in which case you can let them dry on the vine. To me, shell beans are so cheap and green beans so dear, that I rarely grow the shellers. But if you have your heart set on heirloom varieties for soups and stews, plant away. To keep things straight, plant green bean types on one teepee and shell beans on another. I do the same with peas — snow peas on one arch, English peas another, snaps on a third. Don't restrict yourself to starting at ground level. Hanging baskets are a form of vertical gardening, and they are flexible enough to take advantage of sun and shade needs. But remember that hanging baskets and window boxes are real water-guzzlers. You'll need to water every day, and if you're inland, you might be watering three times a day to keep plants from wilting. You could run irrigation lines connected to a timer, but to me they look like patients attached to an IV — not an effect I want in the garden. Increased production, visual complexity, ease of harvest, clean fruit, what's not to like? Your beans will stand up and applaud. More than 90 percent of high school football players will never suit up in college, let alone the pros. But that doesn't stop them from pursuing their dreams. The drought doesn't mean you have to stop growing your own fruits and vegetables. A drip irrigation system will help you conserve water and labor.